Dots and Strands in our Field of Vision: Vitreous Opacity or Light of Consciousness? This is the latest issue of "Holistic Vision". 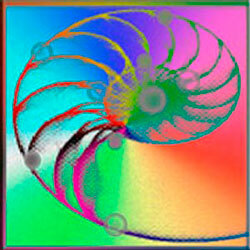 I am Floco Tausin, author, consciousness researcher, and initiator of this spiritual project. The focus of "Holistic Vision" lies on entoptic phenomena, mainly on so-called eye floaters (in ophthalmology known as vitreous floaters or by the French term mouches volantes, see pictures).We see these as easily floating dots and strands in our field of vision. The close observation indicates that there is a correspondence between altered states of consciousness and specific appearances of floaters. Thus, the novel and provocative main thesis of this project is: eye floaters are the first appearances of a shining structure of consciousness within which we cover a distance to our spiritual origin. We can see and experience this way. As an object of concentration and meditation, these dots and strands are therefore a significant key to our consciousness development. 1) Lead Story: Cocoons and fibers. Eye floaters as a source of inspiration for Carlos Castaneda? Eye floaters as a source of inspiration for Carlos Castaneda? The Lead Story is not freely accessible. The following feedback was sent by reader Eric. „Wow, this subject has intrigued me for some time now. I have been on a spiritual awakening path for a long time, but had no idea that the floaters I’ve been seeing could possibly relate to a higher degree of consciousness. I first began noticing them after an altercation some years ago in which my head was slammed against a door, but not enough to cause injury. Immediately after that, I thought I was seeing a fly in front of me and I thought it was real. After awhile, I realized that it would move when I moved my eyes, and thus, internal. Over the years, that “fly” got smaller and smaller and now, when I look into sunlight, I see it as a series of floaters. But I’ve also had the ability to see those “strands” like DNA in my field of vision when focusing on a bright light, like I’m doing now when staring at a recessed light in my ceiling, and then looking away. I begin to see those strands in a circle, moving very slowly. THIS ability I’ve had since a small child. But my real question is what is the difference between these “normal” floaters, and the ones that began after my head injury? Your question gets to the core of the matter: ‘Eye floaters’ is a term referring to different kinds of vitreous opacities. Most of these kinds are caused by sickness or injuries, ophthalmologists may spot and treat them – they have nothing to with consciousness development. As far I can tell, your ‘fly’, caused by the altercation, is one of these real vitreous opacities – it may have been a little blood pouring from the retina into the vitreous. The vitreous opacities are rather rare. 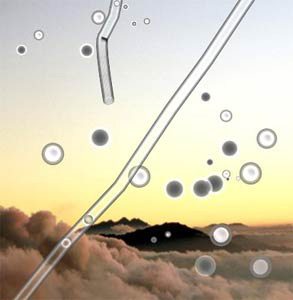 Most people perceiving floaters see the DNA-like highly mobile transparent colorless and scattered strands and dots. You see them best at daylight, in the bright sky. Ophthalmologists consider them harmless, they can't see and treat them. In the US, ophthalmologists sometimes separate them from other floaters by calling them 'muscae volitantes'; in Continental Europe there is no such distinction, the Latin term muscae volitantes (or the French term: mouches volantes, meaning ‘flying flies’) refers to all kinds of vitreous opacities. These floaters are, in my opinion, not a vitreous opacity. Due to the teachings of my spiritual teacher Nestor, and due to a series of visual experiences, I’m convinced that these ‘floaters’ are first appearances of a whole structure which is able to alter the amount of light and its size – according to our consciousness state. That’s why Nestor calls this structure a ‘shining structure of consciousness’. I’ve written about that in my book “Mouches Volantes”. I’m not certain, if your DNA-like strands really are the floaters I’m writing about since you write about looking into a bright light. If you do that, usually you will perceive so-called afterimages – colored spots of light representing the form of the light source you’ve focused on. The question is: Are your strands colored (like afterimages) or colorless (like floaters)? Anyway, you may use afterimages or eye floaters or both for concentration and meditation practices. Thank You, Eric, for your report! Dear readers, do you have personal experiences with eye floaters or other entoptic phenomena? Or any suggestions what they could be? Send your hints, experiences and/or pictures to me, I am very interested. »Nothing in and about the human being develops independent from his lifestyle. Neither gray hair nor wrinkles, dots or strands,« he answered back. »If many people can perceive these dots and strands, it means nothing other than that these people have already built up a certain inner pressure within themselves. Perhaps they haven’t done so deliberately and in a targeted manner. But people who lead a moderately natural life without wasting their energy in idiotic ways will experience that the inner pressure will increase a little in the course of their life. 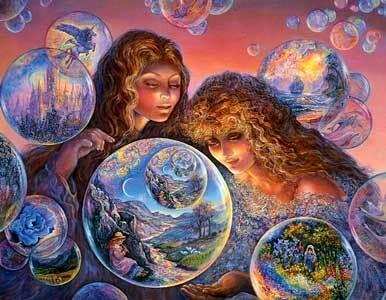 In addition, some people have a higher inner pressure and unbound energy at their disposal from their very birth. That’s the reason why some people are able to see the dots and strands already in their juvenile years – if they care to look out for it. What’s the reason for our ability to see eye floaters? Nestor answers this question by referring to the ideas of “energy” and “inner pressure”. Like other spiritual teachers, Nestor holds that life is created and maintained through the effect of a universal life force or energy. This energy has many names; we may know it as “breath” or “breath of life”, “prana”, “chi”, etc. This energy flows in and through us. If it flows freely in our body, we are healthy and vital. If, however, the flow of energy is blocked, illnesses may develop. Nestor connects the concept of the flow of energy with that of the “inner pressure”. An inner pressure arises if, through a corresponding way of life, more energy is accumulated in the body than may outflow. Physical and spiritual exercises transform the energetic potential of this pressure into spiritual energy. This energy can lead to extraordinary creative efforts in the domains of body movement, thinking or love. The ultimate art, according to the seers, is to selflessly give away this energy to everyone and everything in the “picture”, as it happens through ecstasy. This giving away generates and strengthens the perception of subjective visual phenomena which are partly unknown, partly familiar to us, like the so-called eye floaters. This is also how Nestor and the seers explain how it comes that someone is able to see dots and strings in his or her field of vision even without special exercises or intentions, and without being aware of their meaning. For, over the years, the flow of energy usually increases, first as a result of bodily growth, then through the impact of intense experiences and growing life experience in general. The added confidence and deliberateness in different circumstances that people develop over the years may be understood as an expression of this increased flow of energy. The flow intensifies our sensation, also the inner sense (analogous to the ‘third eye’), with which we can recognize subtle objects. As this energy transformation process happens in every single moment, the development of mild forms of subjective visual appearances is common and widespread. What the seers call “consciousness development” or “building up the inner pressure” is just a intensification and acceleration of that process. As a result, an advanced seeing of eye floaters will be possible; eye floaters are now recognized and experienced as a shining consciousness structure. 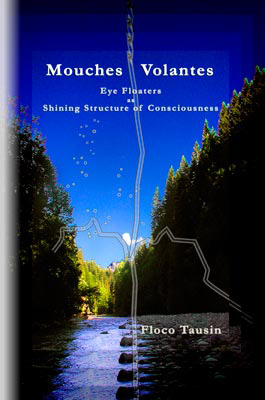 Tausin, Floco: Mouches Volantes – Eye Floaters. The Shining Structure of Consciousness, Bern 2009, (ISBN: 978-3033003378). The category "Quarterly Picture" introduces realistic, artistic, and/or spiritual/religious representations from different cultures and times which could show entoptic phenomena, or be inspired by it. This picture is shown on a website operated by conspiracy theorist Brendan Michael James. James is engaged in the investigation of allegedly secret experiments in which unsuspecting persons are exposed to the effects of advanced energy weapons (Directed-Energy Weapons, weapons based on sound, microwaves, laser and plasma). Although he is not clear about it, eye floaters are represented on the subsite ‘The eye floater dilemma’ to be a result of such effects of energy weapons. In the forum http://eyefloatersinfo.proboards.com, he explains them as “gas plasma, gas plasma particle beams and gas plasma orbs”. Contrary to the medical explanation, he denies that floaters are inside the eye. 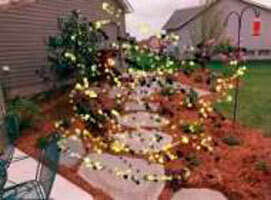 Rather, they are supposed to be an objective reality and thus can be photographed – he provides some photographs of alleged floaters on his website. How it is possible to take a photograph of eye floaters, he can’t (yet) say; his diagram remains difficult to understand. Eye Floaters: A Result of military experiments with energy weapons? 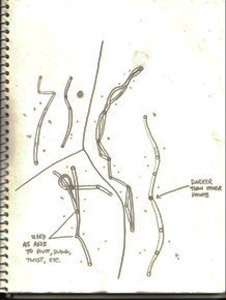 The drawing, however, provided on the same subsite, is crystal-clear: James has drawn dots and strings, known in ophthalmology as idiopathic (without evident cause) eye floaters or ‘muscae volitantes’. Some of the dots freely float in space, others are inside the strings. Moreover, he distinguishes between different kinds of dots, darker and brighter ones, those with thicker or thinner shells, respectively. All of the cores seem to be white, there are no dark cores with bright surroundings, indicating a concentrated state of observation. The strings are partly interwoven, showing clearly the three-dimensional character of that structure. Also, James has correctly observed that single spheres in the strings work as a kind of axis, around which individual sections of the strings swing, shift and rotate. We know that floaters are open to different interpretations. As far as I know, the interpretation of James is one of the most extreme, though: according to this, every single day we have the results of systematic crimes against humanity before our very eyes. Personally, I cannot share such a view in regard to floaters. But if James worked flat out and supported his assertions by plausible arguments and proof, we eye floaters beholders could start a class action against the military in some future time – another possibility how the dots and strings could contribute to world peace. You will find this and other pictures in the gallery. Do you have drawings of eye floaters or other entoptic phenomena (flying corpuscles, afterimages etc.)? Do you know of realistic, artistic, and religious representations of such appearances? Then send me the picture or give me the tip; I would like to publish it in the newsletter and/or in the gallery. The Lead Story is no longer freely accessible. Starting with this newsletter, a user name and a password are needed to activate the Lead Story. The reason for this is my aspiration to make a part of my living by providing high-quality, well researched and unconventional articles and information around the topic of eye floaters. For this, I am dependent on your support, be it a sum of money or an individual contribution to my research (read the information on the registration site) With a single contribution you are given the membership on www.eye-floaters.info, viz. free access to the current Lead Story and to the archive of published and unpublished articles. All of the other categories of the newsletter remain free. Find a complete list with all previous publications (monographs, anthologies, journals) on Website. An updated English version of the bibliography on the topic of eye floaters is ready for download in the category ‚Links‘ on the website. The categories of the bibliography have been brought up to date and reorganized. The new bibliography provides literature or other media relevant to floaters from different fields like spirituality, arts, humanities and psychology, alternative and complementary medicine, ophthalmology and history of medicine.